My children learned the Hebrew alphabet and made a beautiful poster with each of the Hebrew letters illuminated. We also made index cards for each letter, practicing the sounds of the letters. It’s fun to listen to Hebrew being spoken. For the poster, you will need a large white poster board, markers or crayons, and a pencil. You can look up the Hebrew alphabet online. My friend Evonne Mandella sells lots of inexpensive Hebrew materials for teaching your children. I used her materials to teach my own children, and we loved her humor and exuberance in teaching the language. When we studied Psalm 119, the longest Psalm, we realized that the Psalm was an acrostic, with the Word of God described with each letter of the Hebrew alphabet. You can do this same activity with your kids by writing the English alphabet and coming up with a word or phrase that describes the Word of God. The psalmist David loved the Word of God with such intensity that he created this beautiful piece of music to describe the Word of God. I wish I could hear Psalm 119 the way it was sung by David! If you enjoyed making this Hebrew alphabet poster and acrostic, you will love Using Simple Costumes and Props to Teach the Bible. You receive this 2-hour video for free when you sign up for the Unit Study Treasure Vault, which has an enormous Bible section that you will love! This entry was posted on Sunday, October 13th, 2013 at 8:00 am	and is filed under Bible. You can follow any responses to this entry through the RSS 2.0 feed. You can skip to the end and leave a response. Pinging is currently not allowed. Love this idea! 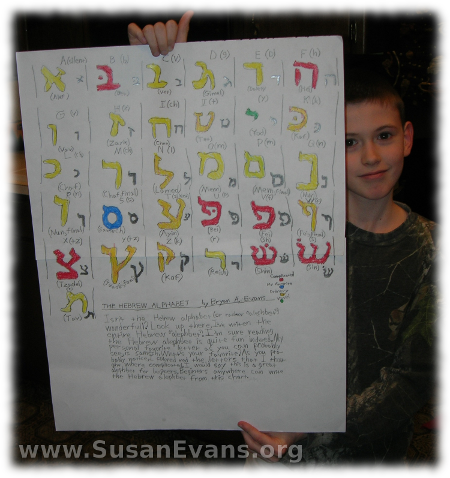 We are always looking for ways to add Hebrew learning to our homeschool. Thank you! We really enjoyed doing these Hebrew activities! Susan, What a FUN activity! I use to homeschool my kids (they are all grown up now) and that would have been a great activity for them. I will save it for my grandchildren. What a great way to learn about God. Thank you!! I would love to be able to read the ancient Hebrew Bible, to know the nuances of the original language. This is a good step in the right direction, to learn the sounds of the alphabet and some words in Hebrew. Beautifully done and the instructions are super easy to follow! I think the kids did a beautiful job! They enjoyed coloring in each of the Hebrew letters. I love that you are teaching your children a different language. It is really important, and will help later on with their education and developmental milestones. Learning 2 languages can also help improve memory. Yes, learning foreign languages is always good for cognitive development in children, and I especially love Hebrew because people from Scripture (the Old Testament) spoke it!